In Jainism, Sangha can mean the assembly of monks, nuns, lay men and women (termed chatrividha sangha) of a region. It can also mean an order of monks and nuns, along with its branches. For example Mula Sangha represents practically all the branches of the Digambar Jain monks and nuns. Sanghapati (Sanghavi, Sanghvi, Singhvi, Singhavi or Singhai) is a title given to a lay leader who makes a major contribution like building a temple or organizing a mass pilgrimage (Sangha Yatra). In Sikhism, sangha is a Punjabi Jat Sikh community and there are two kinds. One is Ludh Sanghas and the second is Asees Sangha. This article deals primarily with the subject of the monastic sangha. Buddhists traditionally consider monastic life to provide the environment most conducive to advancing toward enlightenment, and the sangha is responsible for maintaining, translating, advancing, and spreading the teachings of the Buddha. When a young man aspires to join the sangha of monks, a bhikkhu will first ordain him as a samanera (novice) either for a year or until the age of 20. If the samanera is deemed acceptable and able by the order, he will then receive a full ordination and will now live by the monastic rules of the patimokkha (227 rules for Theravada monks), which are stated in the Tripitaka. A young woman should be ordained, according to Theravada tradition, by both a monk and a nun, first as a samaneri. Then, after a year or at the age of 20, she will be ordained as a full bhikkhuni. The Theravada vinaya has 311 rules of discipline for bhikkhunis. Although always maintaining that women were just as capable to attain enlightenment as men, Buddha originally neither permitted women to join the Sangha of monks nor to form an independent Sangha of nuns. After several entreaties from his aunt and foster-mother, Mahapajapati Gotami, who wished to become ordained, and from his cousin and aide Ananda, who supported her cause, the Buddha relented and ordained Mahapajati and several others as nuns. The Buddha established the condition that each new ordination would be sanctioned by at least five bhikkhunis. There have been several speculative theories regarding the Buddha’s reluctance to ordain women, including the possibility that it was due to fears that a community of women would not be safe in the society of his day. It is interesting to note that this was one of the few issues about which the Buddha is recorded to have changed his mind. Before the modern era, the Bhikkhuni Sangha spread to most Buddhist countries, with the notable exceptions being Tibet and Thailand. However, in Sri Lanka, it died out in the 11th century during a civil war. Because the ordination of nuns require at least five bhikkhunis, it was not possible to revive the bhikkhuni Sanga afterwards. 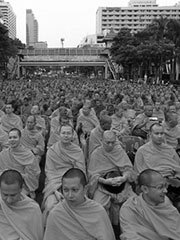 Consequently, as Theravada Buddhism spread to Thailand and Burma, Theravada Sangha consisted only of monks. In recent decades, there has been a serious attempt to revive the Theravada Bhikkhuni Sangha with the assistance of Oriental Mahayanist bhikkhunis Sangah which adhere to Sanskrit Vinaya. This has resulted in a small but thriving community of nuns in Sri Lanka, who in turn ordained the first Theravada Buddhist nun in the history of Thailand, Ven. Dhammananda. However, the validity of these ordinations is strongly disputed by some of the conservative Theravada establishment. Meanwhile, a similar process has produced the first fully ordained bhikkhunis in Tibetan Buddhism. In the west, where feminism has been a strong influence, there have been many remarkable Buddhist nuns: two notable examples are Pema Chodron and Ayya Khema.